A love of books is a gift that may take a child far in life, and one that a local organization wants the community's help to promote now and in the years to come. Join members of Ferst Readers of Polk County this coming Sunday, Feb. 24, for the 5 th annual "Afternoon with the Authors" as they gather to promote reading and fundraising for their ongoing efforts to provide more than 1,100 children locally with books on a monthly basis. The Sunday event at In the Wood on Highway 113 in Rockmart brings four authors to Polk County, along with the annual silent auction of both signed books from famous literary names and handcrafted cakes of various flavors and decoration style. The program begins at 2 p.m. and continues on until 4:30 p.m. Along with Rome's Janet Byington and Merrill Davies, Ferst Readers are pleased to host area writer Susan Sands, and Gordon County's Vickie McEntire to speak at this weekend's event. The quartet of writers will get a chance to share some of their stories with the crowd while everyone has time to look over items up for the silent auction. Both have personal tales that local literary lovers can find common themes. Take for instance Sands, who is a self-described late bloomer in writing. She didn't pen her first novel until she was 40, and related her debut book's publication much like "raising another child – a difficult one." Sands is the author of four southern, contemporary women's fiction novels set in Alabama which include "Again, Alabama" released in 2015, "Love, Alabama" in 2016, "Christmas, Alabama" and "Forever, Alabama" both in 2017. Her novels provide readers with a fun, romantic, humorous small-town stories that are filled with big family love. Sands has three grown children and lives with her dentist husband in Roswell. She has a degree in Elementary Education, is a member of the Georgia Romance Writers, the Romance Writers of America, the Atlanta Writer's Club, and the Broadleaf Writers Association. She participates in book festivals, book clubs, and writer's conferences around the South. She was the recipient of the 2017 Georgia Author of the Year award for romance. Ferst Readers of Polk County also invited along McEntire, an active supporter of literacy and promotes reading—specifically reading aloud to children—by making appearances at local schools and libraries, and on radio and TV. She's a member of the Calhoun-Gordon Council for a Literate Community and the Ferst Readers of Gordon County, and mentors the next generation of writers and attends writers conferences and workshops throughout the Southeast. McEntire conducted a workshop—5 Things Every Children's Book Writer Needs to Know—at the 2018 Red Clay Writers Conference at Kennesaw State University. McEntire credits much of her writing success to the support of the Calhoun Area Writers, a local writing group in North Georgia led by its' founder, Karli Land. She is also a member of the Society of Children's Book Writers and Illustrators and Georgia Writers Association. She released her first children's book, "Baby Birds," in October 2016. It was illustrated by Lana Kipe and nominated for the Georgia Author of the Year Award. McEntire said she was inspired to write her children's book by her three grown children and grandson— her real life baby birds. "Empty Nest," a book of poetry illustrated by local artist and retired teacher, Sandy Dutton, was released in May 2017. Her second children's book, Little Bird and Myrtle Turtle, released in October 2017 and was chosen as a finalist in the 2018 American Book Fest International Book Awards and won the 2018 Georgia Author of the Year Award in the children's book category. McEntire has donated copies of her children's books to Jesus Kids Home in Nigeria, Ferst Readers, Hoosier Hills Food Bank Book Fair, and local school and community libraries. Aside from writing, McEntire also works full time to bring community members together for the benefit of families and children as the Family Connection Coordinator for Gordon County. She writes from her home in Northwest Georgia, which she shares with her husband, Dave, and their cat. These two, along with Byington and Davies, will be on hand to talk with book lovers during this weekend's event. Every dollar raised from the event goes toward supporting Ferst Readers of Polk County. Those interested in more information about how to help Ferst Readers or become a part of the organization can visit ferstreaders.org. A $40 donation helps one child receive a book annually. David Snipes was named the STAR Teacher for 2019 for Polk School District, posthumously honored by STAR Student Jackson Norris who nominated him as the Rockmart High STAR Teacher. Honors were presented to his wife Melissa. Co-STAR Teacher Jennifer Cupp, co-STAR Student Ebrahem Abdul-Rahman and Cayden Frye and co-STAR Teacher Phillip Babb of Cedartown High School joined Rockmart High and Polk School District STAR Student Jackson Norris, and Melissa Snipes, wife of the late David Snipes who was posthumously honored as STAR Teacher for Rockmart High and the District as well in a group photo during the 2019 presentation on Valentine's Day in Rockmart. Jackson Norris was named the STAR Student for Rockmart High School for the 2018-19 school year, as well as the Polk School District's STAR Student to go onto region competition. Cedartown High's Cayden Frye and Phillip Babb were co-STAR Students and Teachers. Ebrahem Abdul-Rahman was the co-STAR Student for Cedartown High School. Nancy Ratcliffe, a retired educator and representative from the Professional Association of Georgia Educators, spoke during the 2019 STAR Student presentation for Polk School District on Valentine's Day. Valentine's Day wasn't just about sweethearts for a trio of local students honored for their academic achievements for the 2018-19 school year. It was also about remembering an educator who made a real impact on the lives of young people throughout their high school careers. Polk School District's STAR Student for 2019 Jackson Norris (who also took the honor for Rockmart High School) said the teacher he chose for this year's honor will always remain with him as a mentor. This was his way of providing a memorial for Rockmart High School band director David Snipes, who died unexpectedly at the end of the 2017-18 school year. "Ever since he came to Rockmart – he came my 8th grade year – I had him ever since for my four years," Norris said. "He had a huge impact on my character and all my motivations. He was a real mentor to me." A soon-to-be graduate of Rockmart High, Norris hopes to pursue a career in Chemical Engineering once he finishes his studies at Georgia Tech. The top-scoring SAT student who is also in the top 10 percent of the senior class has already been accepted to the university in the heart of Atlanta. He's the son of Maria and Jimmy Norris. He served as a member of the Rockmart High School marching band during the fall, and last year was one of the members of the Yellow Jackets boys tennis team who provided assistance to wreck victims. The team stopped on Highway 27 on their way home from a South Georgia playoff victory to help when a man became pinned under a truck. Norris said he hopes students take his experience of hard work and determination as an example of what they can achieve if they put their heart into their education. "It's an honor to be recognized for academic achievements like this," he said. "If you consistently try and make the effort, you're going to get a reward. As STAR Student, Norris will go on to represent Polk School District at a regional level against others in Northwest Georgia. 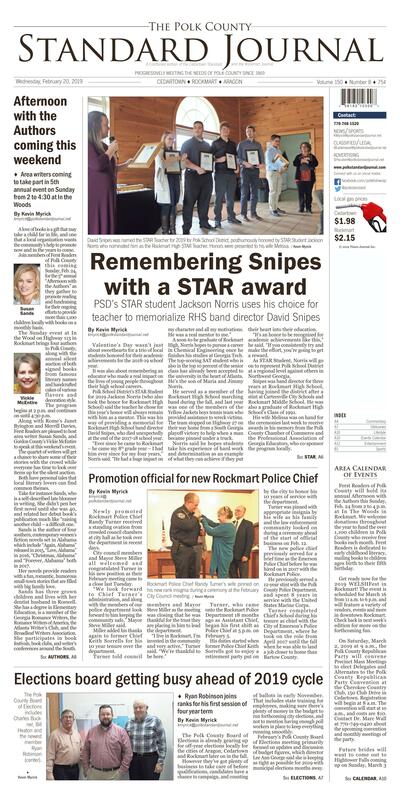 Snipes was band director for three years at Rockmart High School, having joined the district after a stint at Cartersville City Schools and Rockmart Middle School. He was also a graduate of Rockmart High School's Class of 1991. His wife Melissa was on hand for the ceremonies last week to receive awards in his memory from the Polk County Chamber of Commerce and the Professional Association of Georgia Educators, who co-sponsor the program locally. Norris was joined in honors by fellow students at Cedartown High on the school level with two tying for the honor this year. Cayden Frye and Ebrahem Abdul-Rahman were the co-STAR students for the school year, and nominated STAR Teachers Phillip Babb and Jennifer Cupp. Cayden Frye brought along his mom Wendy to help him celebrate the honors last week. He said he's submitted his name to several schools but hasn't made a final decision on where he wants to continue his education but will focus on pursuing engineering. "It feels like the hard work paid off," he said. His compatriot being honored is the son of Wael and Heather, he remained persistent in his goal toward achieving high honors academically at Cedartown High School. Abdul-Rahman also isn't fully decided on where he wants to go to school, but has a clear career path in mind: one day he wants to be arguing in a court of law as an attorney. "Anyone can do anything if they persist," he said. Floyd Polk Medical Center also provided gifts to students for being named the STAR Students representing Polk County. Rockmart Police Chief Randy Turner's wife pinned on his new rank insignia during a ceremony at the February City Council meeting. Newly promoted Rockmart Police Chief Randy Turner received a standing ovation from crowded council chambers at city hall as he took over the department in recent days. City council members and Mayor Steve Millerall welcomed and congratulated Turner in his new position as their February meeting came to a close last Tuesday. "We look forward to Chief Turner's administration, and along with the members of our police department look forward to him keeping the community safe," Mayor Steve Miller said. Miller added his thanks again to former Chief Keith Sorrells for his 10 year tenure over the department. Turner told council members and Mayor Steve Miller as the meeting was closing that he was thankful for the trust they are placing in him to lead the department. "I live in Rockmart, I'm invested in the community and very active," Turner said. "We're thankful to be here." Turner, who came onto the Rockmart Police Department 18 months ago as Assistant Chief, began his first shift as Police Chief at 5 p.m. on February 5. His duties started when former Police Chief Keith Sorrells got to enjoy a retirement party put on by the city to honor his 10 years of service with the department. Turner was pinned with appropriate insignia by his wife as his family and the law enforcement community looked on during a ceremony ahead of the start of official business on Feb. 12. The new police chief previously served for a brief time as the Emerson Police Chief before he was hired on in 2017 with the Rockmart Police. He previously served a 12-year stint with the Polk County Police Department, and spent 8 years in service with the United States Marine Corps. Turner completed Chief's School during his tenure as chief with the City of Emerson's Police Department, where he took on the role from April 2017 until the fall when he was able to land a job closer to home than Bartow County. The Polk County Board of Elections includes Charles Buckner, Bill Heaton and the newest member Ryan Robinson (center). The Polk County Board of Elections is already gearing up for off-year elections locally for the cities of Aragon, Cedartown and Rockmart later on in the fall. However they've got plenty of business to take care of before qualifications, candidates have a chance to campaign, and counting of ballots in early November. That includes state training for employees, making sure there's plenty of money in the budget to run forthcoming city elections, and not to mention having enough poll workers in place to keep everything running smoothly. February's Polk County Board of Elections meeting primarily focused on updates and discussion of budget figures, which director Lee Ann George said she is keeping as tight as possible for 2019 with municipal elections months away. George said those interested in becoming poll workers can contact the elections office for more information at 770-749-2103. The month also saw the start of the newly appointed District 3 representative for the Board of Elections. Ryan Robinson, the branch manager for Family Savings Credit Union and a Rockmart area resident, was appointed by the Polk County Commission during their February session earlier in the month, and took his seat to get started learning the ins and outs of the job. He noted his need to miss the next two meetings during the session last week, but said that he'll be well prepared in time for the 2019 election cycle and the requirements of board members. The coming month will take elections officials out of the area for annual conferences where they'll have the opportunity to learn more about state and federal elections law updates and more. George also added that qualifying fees were set by all the cities for their November elections. Seats are open in Aragon with a $36 fee for those wishing to run for city council and $72 for mayor. Rockmart's fees are $108 for council seats for Ward 2 and Ward 5 and $144 for mayor – an open seat for the 2019 election cycle with Steve Miller ending his tenure after two terms – and seats on the Cedartown Commission cost $54 to run. Municipal elections this year are on November 5, and qualifying for local seats is coming up on August 19 through Aug. 23, Monday through Thursday 9 a.m. to 5 p.m., and Friday 9 a.m. to 4:30 p.m. The voter registration deadline is Tuesday, Oct. 7 this year. Visit sos.ga.gov to learn more about registering. Board members will be back in session on March 12 during a 10 a.m. meeting at the county administration building in Cedartown at 144 West Ave.
Ferst Readers of Polk County will hold its annual Afternoon with the Authors this Sunday, Feb. 24 from 2 to 4 p.m. at In The Woods in Rockmart. We welcome donations throughout the year to fund the over 1,100 children in Polk County who receive free books each month. Ferst Readers is dedicated to early childhood literacy, mailing books to children ages birth to their fifth birthday. Get ready now for the 2019 WELSHFest in Rockmart! The event is scheduled for March 16 from 11 a.m. to 6 p.m. and will feature a variety of vendors, events and more in downtown Rockmart. Check back in next week's edition for more on the forthcoming fun. from 1 to 4 p.m. for their 2019 Bridal Show! Admission is free for the event and vendors will include caterers, photographers, florists, DJs, and more. Samples of catering items will be available, along with discounts and door prizes including a free wedding date giveaway by Hightower Falls! Contact info@hightowerfalls.com to learn more. Sign up now to take part in the forthcoming Chamber-sponsored Lunch and Learn series, coming up again on Friday, March 8. The bi-monthly classes provided by Chick-fil-A of Rockmart owner Zach Thomas gives people the opportunity to learn how Chick-fil-A promotes servant leadership at all levels of the company and in life. Visit polkgeorgia.com to learn more, or call 770-684-5686 to register today! Costs for the class include lunch. MasterChef Junior is holding a casting call in Atlanta at the Hilton in downtown at 255 Courtland St. NE on Saturday, March 9 from 9 a.m. to 5 p.m. The show is looking for talented young cooks to come take part in the new season with Chef Gordon Ramsay, and are looking for 8 to 13 year olds to come join the series. Minors must be accompanied by an adult. Signup now at masterchefjuniorcasting.com for application instructions, audition guidelines, eligibility requirements and more. Belles of the Ball are bringing the chance for girls in need to have a chance to get a free prom dress for the forthcoming season. The organization is holding their first of two events in Carrollton at the University of West Georgia this Saturday, February 16 from 10 a.m. to 2 p.m. A second event will be held in Atlanta on March 16 at the Atlanta YMCA off Pryor Road. The group's Journal inventory includes more than 500 dresses, and DJs, food, vouchers for free hair styling and more are part of the fun. Contact bellesofball@gmail.com for more information. A Pinto Bean fundraiser is coming up on Saturday, Feb. 23 at Live Oak Baptist Church in Aragon from 5 to 7 p.m. to help raise funds for the church's part in Operation Christmas Child's shoebox ministry to cover shipping costs. Pastor Anthony Osborn and the congregation invite everyone to come turn by Burton's Store on Live Oak Road and take part in the meal that includes pintos, limas, and navy beans plus cornbread, fried potatoes, slaw, onion and desserts.